In a mere two days it will become socially acceptable to start every day with a mouthful of chocolate, for company lunches to extend into late night debauchery, and for morning hangovers to be admired rather than reproached. Christmas is coming. I'd like to say I toyed with a healthy pre-tox cocktail, but then a healthy gulp of inspiration courtesy of the Rotary Bar's Anniversary Cocktail led me astray. They make theirs 'festival size' topping up the delicious passion fruit and gin base (with that little Aperol hit) with soda water and, whilst I'm all for necking the stuff by the pint, I prefer to go a little shorter and a little less gassy. So, before you erode your your taste buds with mulled wine and eggnog next month, give them a little wake up call with this pre-Christmas treat. 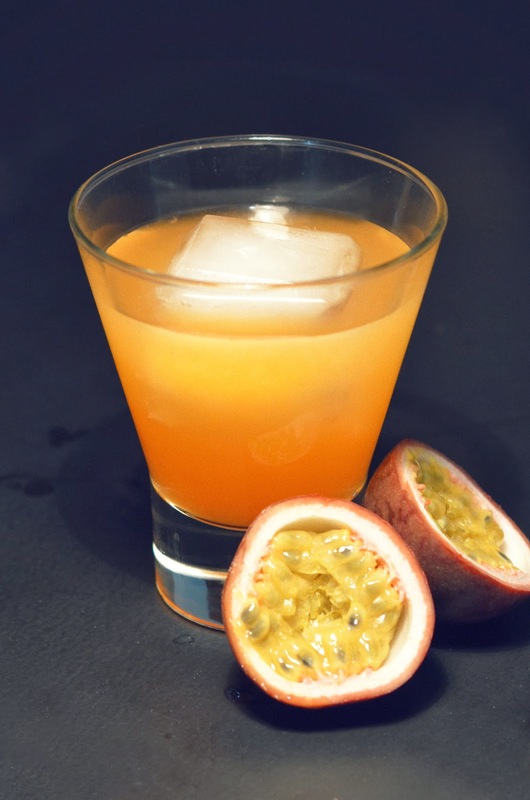 Add to your shaker the gin, passion fruit juice and lemon juice. Shake for a few seconds until blended. Pluck out an oversized ice cube from your freezer and relocate it into a large tumbler. Strain the shaker into the tumbler. Pour the 25ml of Aperol over the top of the drink and serve. If you do fancy it longer just top up with some sparkling mineral water or soda water. Also, if giant ice cubes are your thing, you may want to check out these incredible whisky balls, perfect for Old Fashioned and Sazerac season.